« Why buy the Clarius IR illuminator ? Sometimes in the Security arena a product arrives in the market place that really captures the imagination of those in the industry. 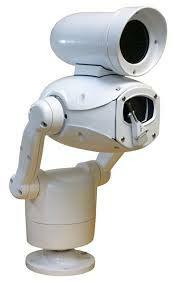 The Predator CCTV camera with all its variants is one of those products. Launched to compete with the Bosch MIC product range the Predator ruggedized PTZ camera has been able to morph into a camera that really can fit into most applications. The 360 Vision PRED can be fitted at airports, harbours, military sites. Schools university’s and hotels. It can be purchased as an HD camera, have built in IR, A white light that gives a fantastic deterrent feature and this camera can even come with thermal capability. There is so many ways to use the Predator CCTV camera. Those who deploy mobile security are mounting these cameras to their vehicles and harbour masters are utilizing the thermal aspect of the cameras to give them a distinct advantage when monitoring our seaports. The PREDATOR CCTV camera is designed to work on a multitude of recording platforms and it will integrate seamlessly into existing systems. It comes as standard with Multi Protocols including Pelco, Ultrak and DM. This allows complete integration with most DVR’s. If your existing set up is an IPCCTV system then there is an IP version of the Predator and because this is ONVIF compliant any video management system can be integrated into quite easily.This includes Avigilon and Milestone two of the most popular VMS systems out there. Perhaps the largest untapped source yet of sales within the security world is thermal. 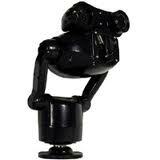 360 vision have recognized this and the Predator Thermal is available in either 320 or 640 pixel resolution. This definition is more than enough to pick up heat sources at distances of 2.5K in absolutely zero light conditions. When used by on-site security guards this is an extremely powerful tool. One feature that has been asked for by many is temperature sensing from the thermal core that will lead to an alarm condition. This can be particularly useful in the waste industry and in areas where expensive plant needs to be protected against fire. The new 320S offers temperature sensing with up to 10 ‘Temperature Alarms’ to monitor Preset positions. This means that if the temperature rises or drops below a pre-defined temperature range, then an alarm condition that can be created and transmitted to a central station triggering a reactive response and hopefully limiting any damage that may be caused. To complement the Thermal range there is also another offering that gives fantastic pictures at night. The IR version of the Predator now has 125m of IR illumination. Added to this camera is also the Ultra Bright White Light LEDs meaning images can be produced in both monochrome and colour. A great feature but we believe the white light offers much more than just colour images at night. It brings a whole new deterrent value to your security system. Imagine as this light follows an intruder, either automatically through the use of alarm presets or manually as a guard is able to follow every move an intruder is making. It really does hand the advantage to the guard and business owner and remove any doubt for the intruder that he is being watched, recorded and more than likely going to be caught committing any crime he may be considering. 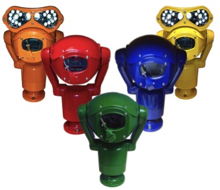 One final feature that highlights 360 Vision’s sense of fun as well as a clever commercial tool is that you can buy the Predator camera in just about any colour you may want. Add to this a new innovation where by you can get any pattern transferred onto the camera. It maybe camouflage or perhaps need to fit with the brickwork pattern of the building it is being fitted to. This now means you can have a camera that will either stand out or blend in to any situation that maybe required, this it has to be said is quite brilliant! The HD predator is just the latest addition from 360 vision so in essence we can say the Predator is colourful, practical and effective, most of all though, it is a camera that is proactive NOT reactive, something we all want and need these days. This entry was posted on Monday, May 19th, 2014 at 19:35	and is filed under Predator CCTV camera. You can follow any responses to this entry through the RSS 2.0 feed. You can skip to the end and leave a response. Pinging is currently not allowed.